Tackling the scourge of systemically dangerous financial firms requires a theoretical and empirical understanding of their evolution and dynamics. But before the Great Recession, only a few academics analyzed situations in which market participants were of similar sizes and they found that interbank deposits could act as primary channels for liquidity shocks (Allen, Franklin, Gale ). Some other scholars concluded that interbank credit extensions could result in banks that were “too interconnected to fail” (Freixas, Parigi, Rochet). Recent academic research suggests that this may lead to the exacerbation of externalities. Further post-crisis studies considered sectors or market systems that did not have equal-sized participants. They concluded that shocks to the most interconnected banks spread widely across the financial system (Gai, Haldane, Kapadia) and that large interbank exposures were linked with systemic risk (Cont, Moussa, Santos). Now, late to the game, regulators such as the Basel Committee on Banking Supervision (BCBS) have sought to identify certain characteristics that determine an institution’s level of systemic importance, and interconnectedness is one of them (Federal Reserve, BIS). And finally, the Federal Reserve has begun collecting and disseminating data on the contributions of large financial institutions—dubbed “globally systemically important banks” (G-SIB)—to systemic risk. An important feature of this new FR Y-15 report is the measurement of intra-financial activities via the “Interconnectedness Indicators” in Schedule B and the data collected is similar to BCBS’s assessment of global systemic risk. The FR Y-15 report is accessible on the National Information Center’s website and covers holding companies (banks and Savings & Loans) with total assets of $50 billion or more as of June 30 of the reporting year. 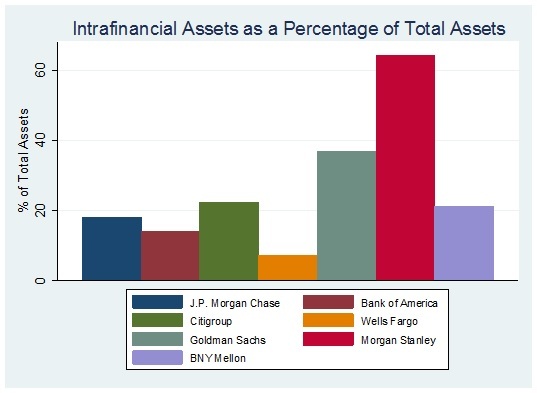 Of the 39 holding companies listed as having total assets of greater than $50 billion, 33 banks filed the report, with AIG, GE Capital, Teachers Insurance and Annuity Association, Charles Schwab, State Farm Mutual, and United Services as exceptions.